The development of new high-performance materials for energy, aviation, transportation and other fields requires a detailed understanding of the correlation between structure, composition, processing and properties. Increasingly, it is necessary to measure the structure and composition of materials at higher spatial resolution, with greater efficiency, and on real materials operating under real conditions. Recent advances in techniques such as focused ion beam and electron backscatter diffraction in the SEM, synchrotron x-ray and neutron diffraction, and surface analysis using electrons, x-rays, and ions have allowed much more information to become available to the materials scientist. 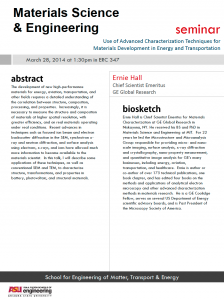 In this talk, Ernie Hall will describe some applications of these techniques, as well as conventional SEM and TEM, to characterize structure, transformations, and properties in battery, photovoltaic, and structural materials. 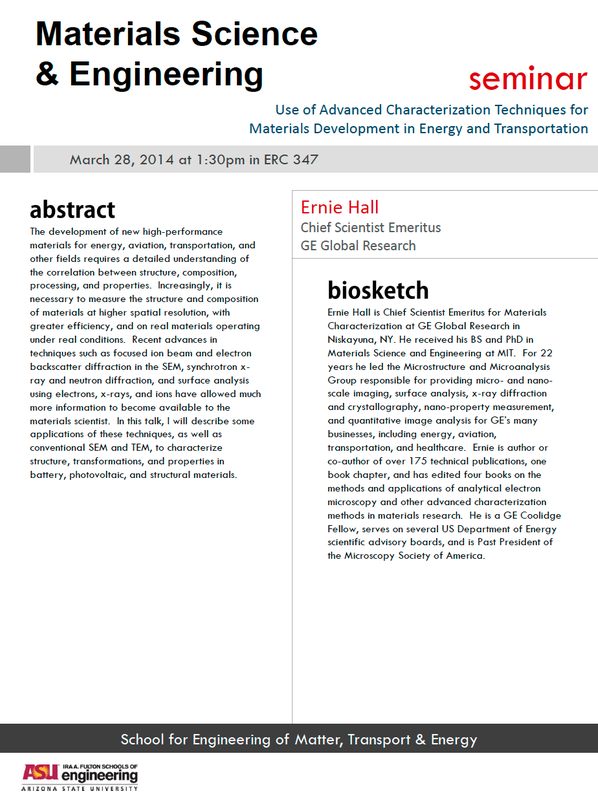 Ernie Hall is chief scientist emeritus for materials characterization at GE Global Research in Niskayuna, N.Y. He received his B.S. and Ph.D. in materials science and engineering at MIT. For 22 years he led the Microstructure and Microanalysis Group responsible for providing micro- and nano-scale imaging, surface analysis, x-ray diffraction and crystallography, nano-property measurement, and quantitative image analysis for GE’s many businesses, including energy, aviation, transportation and healthcare. Hall is author or co-author of over 175 technical publications, one book chapter, and has edited four books on the methods and applications of analytical electron microscopy and other advanced characterization methods in materials research. He is a GE Coolidge Fellow, serves on several U.S. Department of Energy scientific advisory boards, and is past president of the Microscopy Society of America.